Presently, there is no LinkedIn scheduling tool available on the LinkedIn platform. 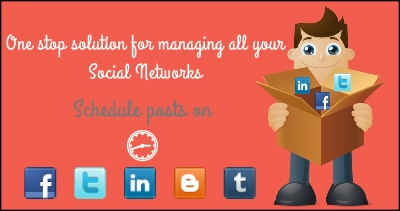 But luckily, there are some LinkedIn post schedulers can help use to post on LinkedIn regularly. Some tools are even free to use, so you can schedule LinkedIn posts in a free way. As LinkedIn has more than 300 active million users, publishing a post is critical to developing your network on LinkedIn. If you don't have time, you can use LinkedIn automation tools to help you schedule LinkedIn posts. In this article, you will learn how to schedule LinkedIn post easily. Besides, we will also cover 10 best LinkedIn post schedulers on desktop and phone. As we all know vidoes play an important role in branding yourself and company, so it is better to schedule video post. Here we recommend using Filmora9 to make LinkedIn video. It is easy to use with various filters and transitions to make your video engaging. More than that, if you want to add text/titles, Filmora9 also supports importing text templates. When exporting, you can choose mp4, mov, avi and more formats for uploading videos to LinkedIn. Just downlaod it now to have a try! Method one: If you are lucky to find the right LinkedIn scheduler, the steps to schedule posts will be so much easier. Here, we can use Postcron to help us schedule LinkedIn post. You can use it on desktop and phone, so you can schedule LinkedIn post anywhere and anytime you want. Besides, if you have more than one posts needed to be scheduled, you can also use bulk importing to schedule. Check the steps below to know how to schedule post one by one. When you want to schedule LinkedIn posts using a LinkedIn scheduling tool, suppose Postcron, firstly you must log in to the Postcron account through Google Plus, Twitter or Facebook. Once logged in, you have to select the LinkedIn account or accounts where you wish to schedule the posts for publishing. You may also add other accounts using the LinkedIn button on the top right corner, under add accounts. Then, upload the content you wish to update your LinkedIn account with and schedule LinkedIn post. Method two: Above are the basic steps to schedule a post on LinkedIn. If your only want to schedule one post, that is great. You can use this way. But if you want to schedule more than one post, say 100 posts, what would you do? In fact, Postcron also can shedule LinkedIn bulk posts at one time. Check the steps below. You will use Google sheet to import your post in a specified format, so the first thing you need to do is create a Google sheet. Here is an example offered by official. You can follow it to fill out this sheet. You need to bear in mind that the sequence is very important while you enter information. In column A enter the text you want to post. In column B you need to set the posting year, column C for the month, column D for the day, column E for the hour, column F for the minute. In column G you can enter the image link if you have and the image format must be .JPG or .PNG. In column H you can enter a page link. At first you may feel this is complicated, but it is still easier than publishing LinkedIn post one by one. Once the sheet is done, log in Postcron like in the method one. Click Or upload a file with lots of posts all at once to start importing Google sheet. The uploading process may need a few seconds. 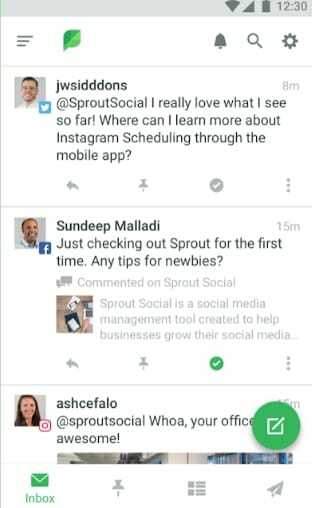 Sprout Social is a great scheduler to post on your phone anywhere. You just need to set the posting time. The steps are easy to make. Select the post you want to schedule after your wote the post, and then choose a time to post. But, one thing you need to know it is wise to know the best posting time on LinkedIn. With this tool, you can also monitor social and brand on the Intenet for better posting. After posts are sent, view cliks and likes. Crowdfire is a LinkedIn post scheduler that you want to use as a businesses and individual. 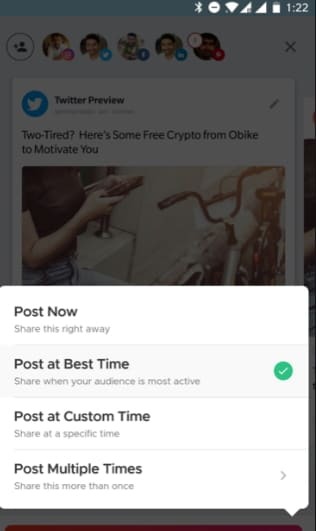 You can write your post and then schedule them automatically. In this way, you can save many times and energy. You can also use extension to share pages you like. More than LinkedIn, you can also schedule posts on Twitter, Facebook and more. Agorapulse is a professional LinkedIn post scheduler. It divides users into 3 categories: agency, teams and small business. You can choose Agorapulse to schedule linkedin posts according to your needs. Many famous brands are their clients. In order to engage your audiences with the right set of messages, it is essential to create relevant posts. When you schedule LinkedIn posts using a LinkedIn scheduling tool, it makes your work easier, simpler, and most importantly faster. 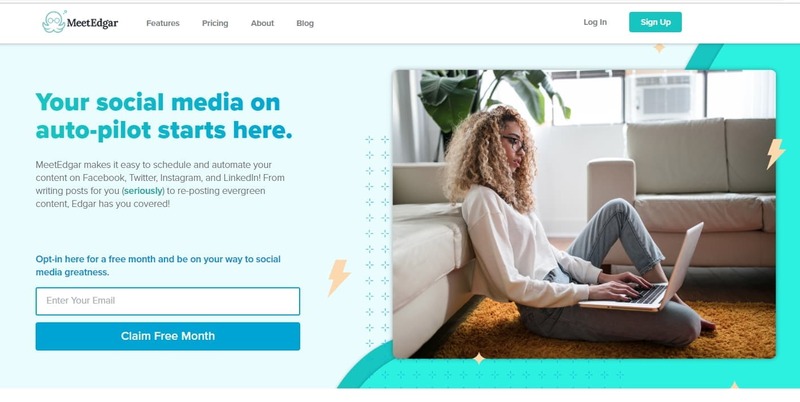 Time is precious and when you get access to a free scheduling tool to manage all your scheduled posts on social media at one go, what more could you ask for. There can be nothing better than cutting down on time for the same work again and again. It ensures great content curation or creation, posting, scheduling, and tracking at one go without waiting for any particular time. So, make use of these great LinkedIn scheduling tools for mobile and desktop to manage your social media posts in just a few clicks. How to Use Markers in Video Recording and Editing?